Hip Chick Farms: Support us with edible credits. Hip Chick Farms makes hand-crafted, delicious frozen chicken fingers, chicken meatballs, and chicken wings. All of the products are made with impeccable ingredients, humanely raised chicken and sustainable practices. We are the Johnson family from Sebastopol, CA. We created our products from our love of food and family and desire to provide family friendly solutions for lunch and dinner. 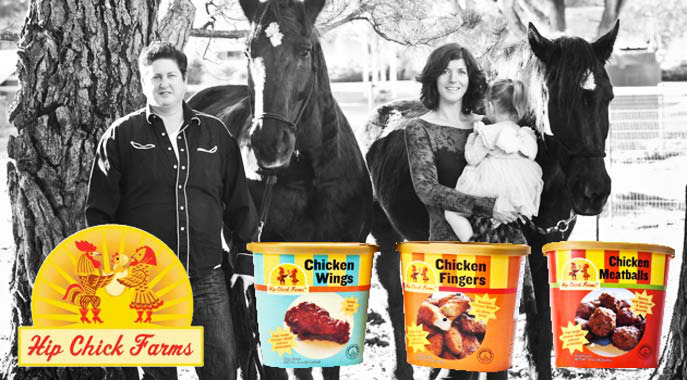 Hip Chick Farms products are natural from start to finish. There are no added hormones, antibiotics, artificial preservatives or filler in the products and by freezing them, quality and purity are ensured. Hip Chick Farms has been working closely with local farmers to create lasting partnerships that support our community, economy and ensures the highest quality of products. We are experiencing rapid growth and interest in our products. We are raising capital in order to buy two pieces of machinery to expand our operations. Trying out Hip Chick for the first time? Here's a low entry level for you to get started. Chef made lunch at our Farm for family of four! At the register, use the Credibles app on your smartphone to redeem your credits for Hip Chick Farms.